Siena Joy Stewart. My precious niece. My sister Valerie and her husband Shawn are two of my favorite people on the planet. So far, they have produced another one of my favorite humans, my nephew Jack. At 2:36 pm, after many hours of heroic labor, my sister gave birth to a little girl (20.5 in; 7 lb 11 oz.) who I’m quite convinced I’m going to be a big fan of: Siena Joy Stewart. Yes, she was a week late, but I’m sure that’s just a matter of the extra quality in preparation involved. She’s going to be a very special young woman. When Jack was born, I wrote him a prayer because I realized, besides smashing cars with him, prayer is probably my main responsibility towards him. I’m going to do the same for Siena. My wife and I have been praying for her daily for some months now and I’m sure there are years of prayer to come, but these are just a few hopes and dreams, blessings and pronouncements on her. Holy Father, thank you for your many gifts. 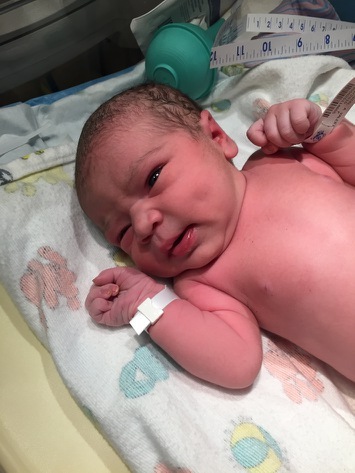 Thank you specifically for this new blessing of a wonderful little girl, Siena Joy. Thank you for your providence that has brought her to us. Thank you for this grace on the life of Shawn and Val as parents. I anticipate that we will not stop giving thanks to you for her all of our days. Thank you, gracious God, for the promise contained in her name for who this little girl will be one day. Already she is a deep joy to her family. I do pray that you make that a continuing reality. That Siena Joy would fill the lives of all she knows with that deep, cavernous joy that comes with being in the presence of one graced with the gifts of God. I also pray that she would live into her name, “Siena”, whose character reflects that warm, earthy depth of her mother and father. Beyond that, I want to pray some specific things for her. Father, as much as I love having her as a niece, I want her as my little sister in Christ. Let this be the reality that forms the core of who she is. Courage. It takes courage to follow the call to whole personhood out in a world broken by sin and evil. I pray that Siena Joy would be marked with a fearlessness that is grounded in her assurance that her heavenly Father is for her and keeps watch over all her steps as she seeks to follow you. Mercy. We live in a graceless culture where judgment consistently triumphs over mercy. I pray that Siena Joy would be a woman of great mercy, whose tender heart towards the broken and afflicted by sin would be a sweet balm that blesses all she meets. Holiness. Please, Father, set her apart. Set her apart all the days of her life, so that her life may shine with the beauty and glory of holiness. But not a holiness that keeps its distance, but the contagious holiness the draws others in to your arms of grace. Insight. Give Siena insight by the Spirit–eyes to truly see. Give her vision through the veil of lies and deception that so often clouds the eyes of the heart and stops us from beholding your untamed goodness. May she live with a vision of her God, the whole of her life. Assurance. May this vision then give her assurance. Both of her salvation, but also of her calling to glorify you in all the particular gifts that you have graced her with. She has been fearfully and wonderfully made, with eternal purposes in mind. May she plant her feet firmly and step forward in confident assurance. Hope. May this assurance be the substance of a deeply hopeful character. I have no idea what our world holds, but I pray that Siena Joy would look forward and know that her future is determined, not by the powers of the world, but by the mighty, gracious power of her Lord Jesus Christ. I ask these things with great faith and anticipation, grateful in advance for what you’re going to do, in the Name of Jesus, Amen. Congratulations to your family Derek and what a beautiful prayer. I am sure you will be Siena Joy’s favorite uncle.